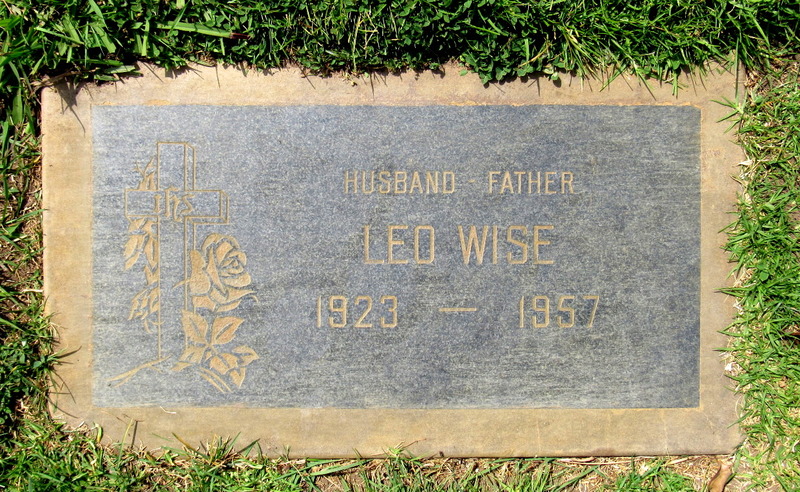 Officer Leo Wise of the University Division, a nine-year veteran of the LAPD, was walking his patrol on Sunday, March 17, 1957 -- St. Patrick’s Day, and less than two weeks after Wise's 34th birthday. As he walked along Pico Boulevard near Figueroa Street -- near the current site of the Los Angeles Convention Center, south of Staples Center -- a bartender came out of a café and told Wise that there was a drunken customer inside causing a disturbance. Wise went inside, escorted the man out to the sidewalk, told him he could either go home or go to jail, and the customer left. Later, when the man returned to the café, Wise also returned, to arrest the man for creating a disturbance. Once again, Wise escorted the man out to the sidewalk, but this time he went to a police call box to request a patrol car to take the man to jail. As Wise reached the call box, the man grabbed Wise's service revolver and shot him in the back. After shooting Wise, the man ran off, jumped into his car and sped away. Four men who were sitting in a parked car near the intersection saw the shooting, and raced over to help the fallen officer. But Wise refused their help, and told them to follow the fleeing car and get the license number. Wise was born March 5, 1923, in Pennsylvania, moved to Los Angeles, and married Charlene Mae Trigg. He joined the LAPD on Jan. 5, 1948, a few months after their first child, Stephen, was born in October 1947. Three more children followed – Gail in December 1949, Kathleen in October 1951, and David in January 1955. Wise was a veteran of World War II, serving with the U.S. Coast Guard. The family lived in Gardena. Wise’s killer, who had been convicted of manslaughter for killing his wife in 1937 and served three years in the Colorado State Penitentiary, was convicted of first-degree murder in a jury trial. After numerous appeals to the California and U.S. Supreme Courts were denied, he was executed in the gas chamber at San Quentin State Prison on July 12, 1961. Wise left his widow and four young children, all under the age of 10. He was buried at Holy Cross Cemetery in Los Angeles. Wise's sign is located on the southwest corner of Pico Boulevard and Figueroa Street, in front of the Los Angeles Convention Center.